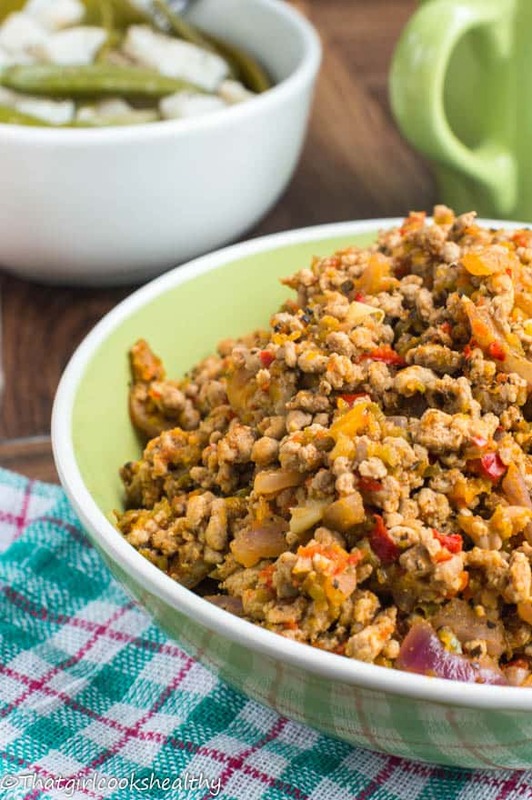 Turkey mince recipe that’s seared and cooked in sofrito, simmered with chucks of yucca and sugar snap. Great to prep in bulk and eat over a series of days. Cubanos like other island folk love their yucca, yucca is known as cassava by the English speaking Caribbean islands. As a youngster growing up I don’t recall too many memories of eating yucca, in fact I wasn’t very keen on it, probably because it wasn’t sweet. Nevertheless, I wasn’t left with an option, mother wouldn’t allow us to waste food and if we objected then we’d go without (well not literally). We would make yucca aka cassava into what’s known as bammy, a Jamaican flatbread that predates back to the original inhabitants , the Arawak Indians and serve with stewed fish and callaloo, in spite of not being too enthusiastic about this root vegetable I did eat it and enjoyed the aforementioned dish. You can find yucca embraced in many contemporary diets such as the paleo diet, part of it’s caveman principle is to eat starch enriched foods which coincide with many Caribbean/African root vegetables. Yucca/cassava is also milled into cassava flour, used either as a thickening agent in food or by paleo/gluten free dieters as a grain free alternative. There’s no surprise that this crop is a favourite simply because it’s a clean starchy veg. Starchy veggies usually contain large amounts of glucose which need to break down and convert into cellular energy. The body relies on vital sources of Carbohydrates to sustain itself, this is why I’m always weary about diets echoing the sentiments of a low Carb eating only principle for weightloss, too low can lead to hypotension, caused by a nutritional deficiency (a lack of basic macro nutrients being transported around the body). While I don’t want to write an entire essay about yucca I will say it’s nutritional content is golden, most noted for it’s vitamin k, B6, B12, minerals such as calcium and vitamin C – from bone strength to cognitive function. I Purposely paired the yucca with sugarsnaps, a lovely sweet vegetable and lean turkey mince. Now that the weather is warming up I’m doubling up on my macro nutrients to supplement my exercise regime. 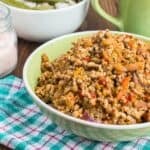 If you’re a part of the paleo crew or simply looking for fun ways to incorporate Caribbean food while eating lean, clean without excess fat, then this meal is dedicated to you. To begin with I cleaned the meat Island style using lime and vinegar – it eliminates any slime, debris while acting as a neutraliser for the meat. I roughly chopped the yucca, put them in the pan with the sugar snaps and parboiled them both for 3-4 minutes, so they can cook evenly during the latter steps. The turkey mince needs to be seared to seal in the flavours from the sauteed onion and garlic and then the rest of season is added as the meat begins to generate its own liquid and break down further. The flavours from the veggies/herbs are identical sofrito (Caribbean green seasoning) and Cubano style with the bell peppers, cumin, oregano coupled with the paprika, black pepper, pink salt, coconut aminos and generous squeeze of lime. As the meat generates its own liquid to braise and lends a lovely aroma, add the parboiled veggies, cover the pan with the lid and leave on a slow simmer for 10-15 minutes. Side note, you can purchase yucca/cassava in anh neighbourhood with a large African or Caribbean community. Alternatively, you may find it featured in other ethnic stores too. Begin by parboiling the sugar snaps and chopped yucca for 3-4 minutes, drain and set aside. 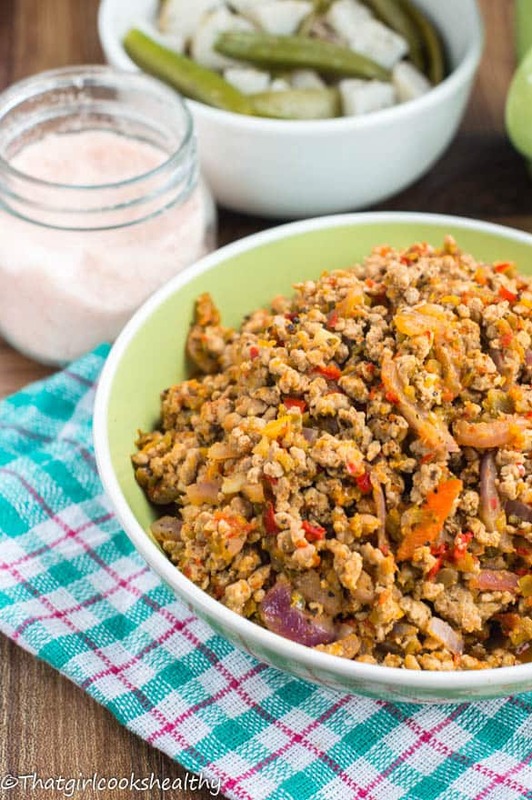 Proceed to heat the coconut oil in a large frying pan on medium and saute the garlic and onion for one minute, then add the drained turkey mince and sear to seal the flavour. Use a wooden spoon to break up the mince meat as it begin to darkened. As the colour deepens, the meat will generate its own liquid, don’t worry about absorption, it will act as a light braise. Season the meat with the cumin, pink salt, black pepper, oregano, paprika and stir and fold the meat. Now fold in the bell peppers, lime juice, coconut aminos followed by the vegetables. Stir thoroughly before reducing the flame to low, cover pan with lid and continue to cook on a slow simmer for a further 10-15 minutes. Check the pan frequently to ensure the moisture level is suffice, they should be a very shallow amount of liquid left over from the meat braising. Once cooked remove pan and serve accordingly. 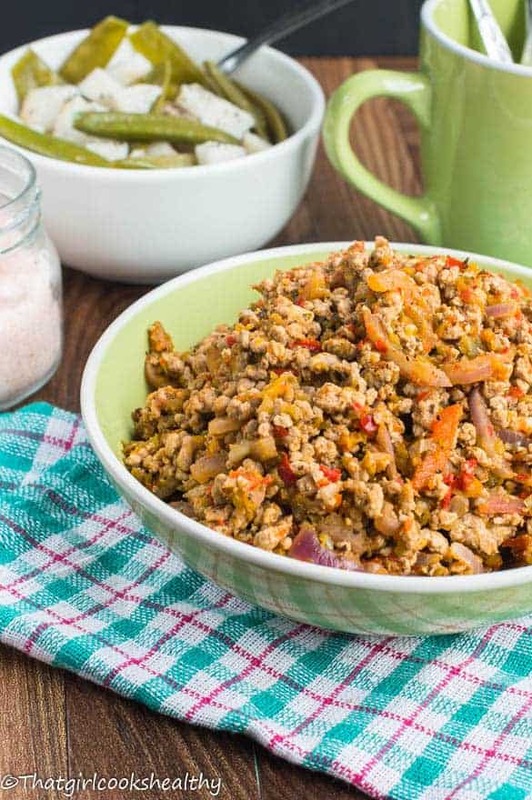 Ooh a cuban style turkey mince with yuca sounds super delicious Charlene & I just love all the spices and aromatics that you’ve got going on in them too. This looks like a dish I would totally want to recreate. Thanks for sharing! You will definitely like this one Imma, it’s not hot but generously seasoned. The spices in this dish are making my mouth water! 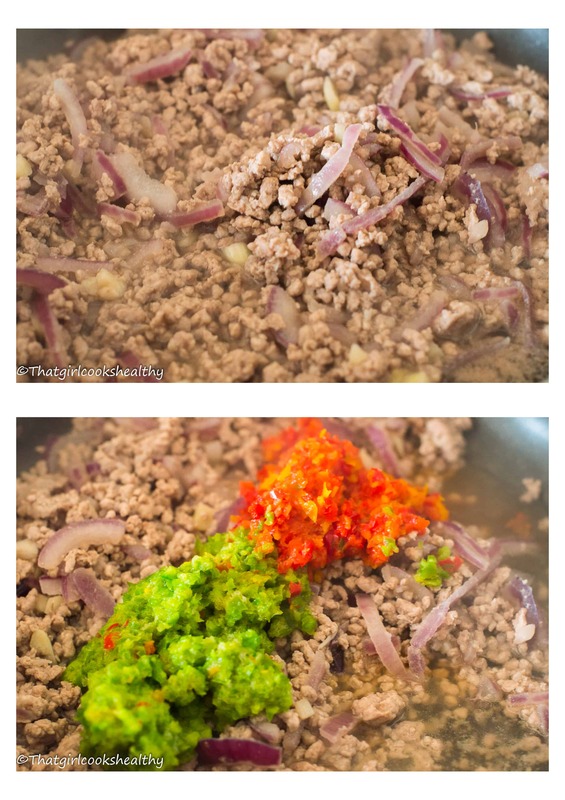 And using turkey mince keeps it lean. Love it. Will be pinning this. We have just started a new food sharing website and would love if you would think about submitting this dish to it. Thank you. Yes, certainly I will definitely do that.